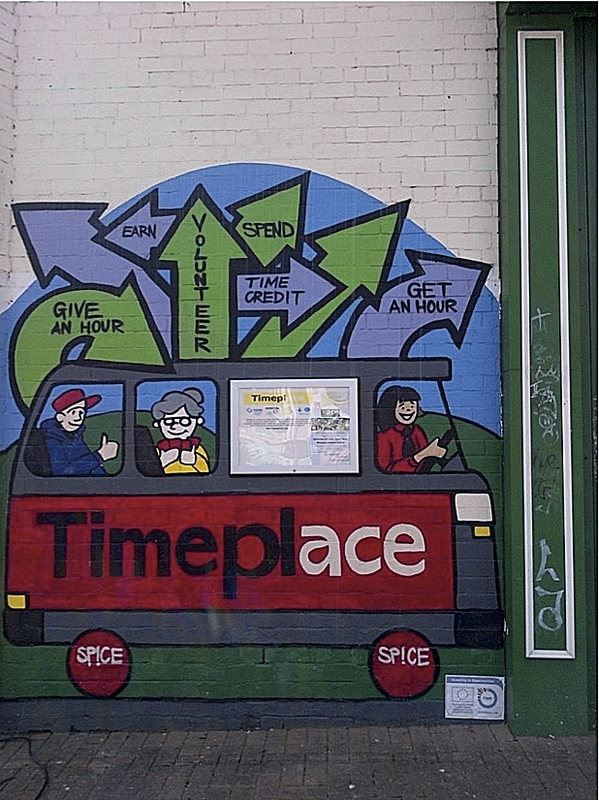 Image: Street art depicting Timebanking in Cardiff, M. Pill 2014. In Cardiff, capital of Wales in the United Kingdom, austerity governance is playing out on two scales: that of the Cardiff Partnership promoted by the Welsh Government; and of neighbourhood structures and practices adopted by the Cardiff Partnership, orchestrated by Cardiff Council. These strategies and practices follow the discourses of ‘devolution, decentralisation and downloading’ characterising ‘urban austerity’ (Peck, 2012). Following the national collaborative discourse that ‘symbolically’ distinguishes Wales from England, Cardiff Council has sought to cope with austerity politics through enrolling its statutory service-provider partners into the neighbourhood approach and latterly by seeking to enrol citizens, with the inculcation of new governmentalities of (place-based) community and self-reliance. Although there are signs of citizen activists rallying in defence of specific public services and spaces, a generic movement against public expenditure cuts on any scale is lacking, as well as its crossover with the Welsh nationalist movement. The chapter will show how the city experiences a mix of trajectories of participatory governance under austerity (Blanco and Davies, this volume), especially those of ‘continuity’ and ‘retrenchment’. ‘Enhancement’ can be discerned in the facilitation of community group/ third sector organisation engagement in co-production of or self-provisioning for community and social needs at a neighbourhood level, including some indications of ‘innovation’. Such enhancement of participation can be critiqued as being for the narrow, instrumental purpose of management of service provision. However, the beliefs and practices of government officials, community/third sector organisations (TSOs) and citizens show a mix of arrangements that combine formal and informal practices, providing a picture with subtleties that the aggregate blanket of neoliberalism under ‘austerity urbanism’ often overlooks. By focusing on the work of Newman (2009; 2013) and Skelcher and Smith (2014), the chapter will unpack this detail by drawing on the concepts of ‘hybridity’ and ‘assemblage’ to reveal a more complex and subtle positioning on a continuum, which generally locates co-optation and resistance as the two opposite ends. Dichotomies such as insider versus outsider roles, and of tensions in community/TSOs between servicing government requirements and retaining their social mission, are blurred. Hence, Cardiff can be viewed as a ‘landscape of antagonism’ (Newman, 2013) constructed through dynamics that reflect the interplay of the city’s dominant neoliberal rationalities combined with ‘residual elements’ and ’emerging repertoires’ developed by community/TSOs . Research in Cardiff illustrates that contesting discourses and interpretations play out at the individual as well as organisational level, with officers of hybrid organisations wearing ‘two hats’ to deal with the ‘self-work’ of reconciling personal commitments with the organisational rationalities of austerity governance. This interplay has given rise, albeit limited, to innovations, such as ‘timebanking’, which could potentially be up-scaled as alternatives within the dominant, boosterist approach pursued by the city’s political elite.